Along with the mayor, a number of academics and philanthropic groups are sketching visions of a different Detroit. One such vision has urban farms and park spaces filling the acres of barren patches where people once lived and worked. In a city of roughly 140 square miles, vacant residential and commercial property accounts for an estimated 40 square miles, an area larger than the city of Miami. 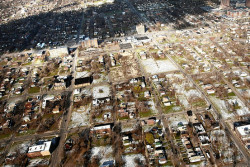 But Detroit possesses a scarce resource its suburbs and airport do not: density. Developing the city's edges while tilling its core isn't sustainable in any way that counts. As David Owen argued last year in Green Metropolis, the surest, most efficient and self-sustaining way to reduce carbon emissions while preserving green space is to increase density. And Detroit offers one of the very few opportunities in the country, if not the world, to literally plug-and-play. Hantz Farms, an enterprise run by local businessman John Hantz, stands to be the beneficiary, taking over as many as 10,000 acres of Detroit land. Hantz's vision involves making Detroit a locavore mecca, attracting tourists and creating thousands of green jobs through agriculture. The situation in Detroit (and other rust belt cities) is fascinating, and the way it plays out will tell us a lot about the future of our old industrial urban centers. There is amazing potential, especially when there are $100 homes (great for artists with little-to-no income) and other glimmers of hope.